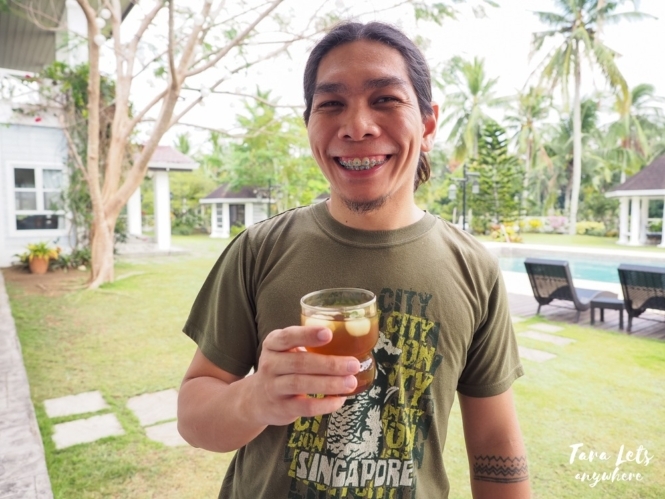 We’re always on the prowl for private resorts or rest houses near Manila where we can escape for the weekend and relax. 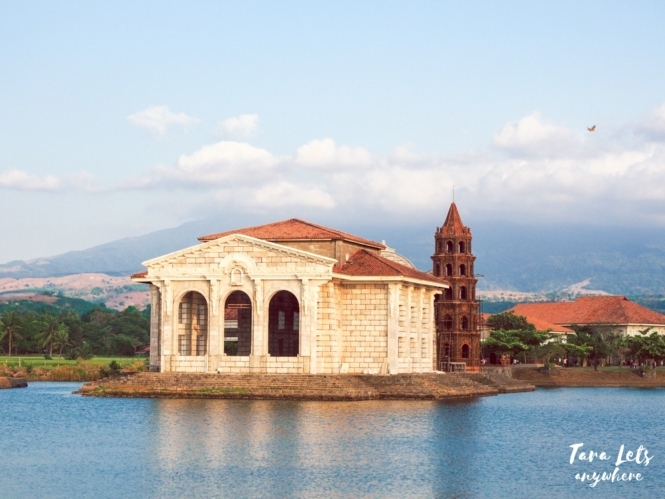 We’re lucky to have found this beautiful rest house in Batangas, which is a mere 1.5-2 hours away from Manila! 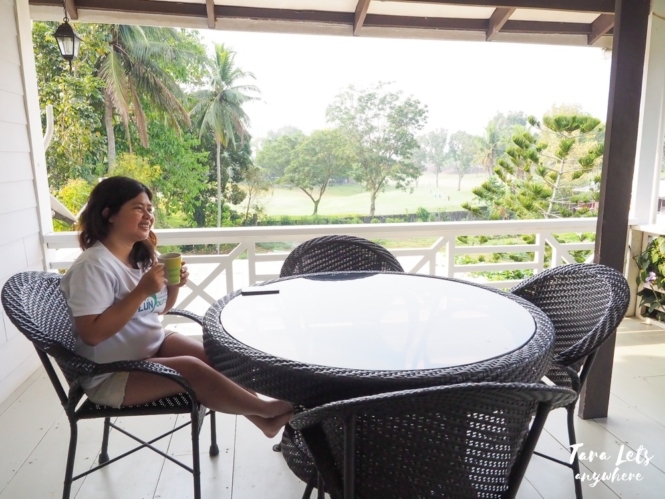 Hali and I went here along with other blogger friends, and in this feature we’re going to tour you around Casa Belinda in Lipa, Batangas. 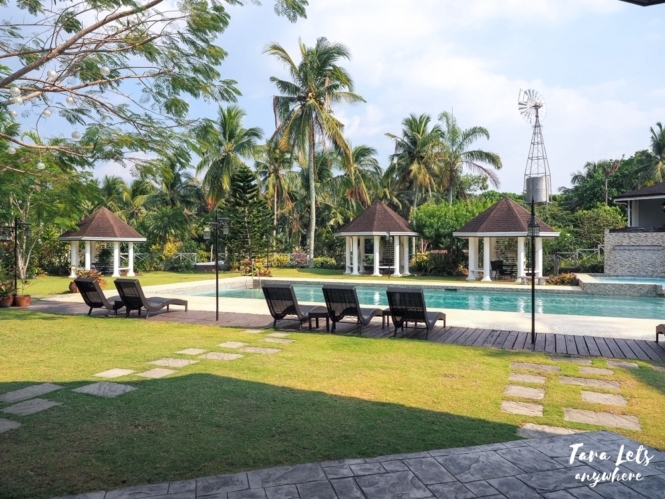 Casa Belinda is a family-owned rest house in Lipa, Batangas, close to Mount Malarayat. 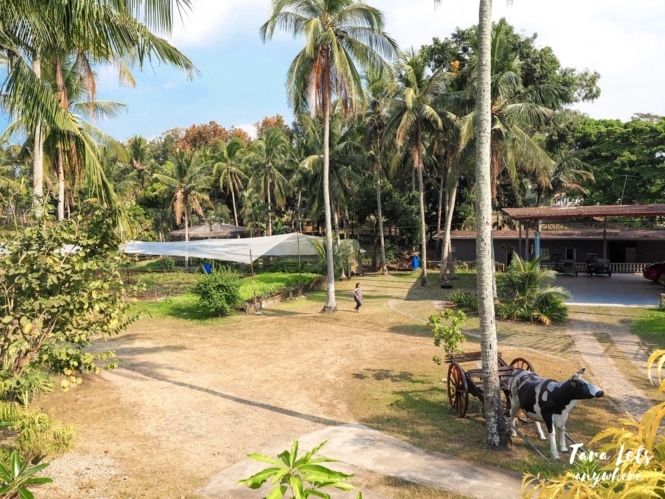 It was originally a ranch where horses are raised and taken care of, and it is now a modern rest house set in a multi-hectare farm. It has a standalone 2-bedroom cottage as well as other rooms, a swimming pool, and plantation where fresh organic lettuce is produced. 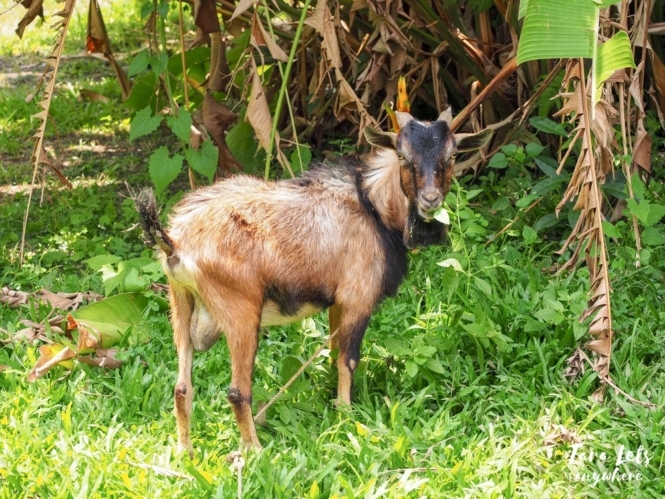 You can also see animals here, such as goats. It’s ideal for families, group of friends, and even honeymooners who want a more exclusive location to spend their weekend. There are several types of accommodations in Casa Belinda. The main one is the 2-bedroom cottage. We chose to stay here as the caretaker said it’s the favorite among guests and it’s also the one being rented out in Casa Belinda’s Airbnb page. Ours was the master bedroom. It’s spacious and has glass windows where you can find yourself surrounded with pine trees outside. As with the rest of the house, it has airconditioning, although we turned it off as we found the place cool enough during the night. Hali in the master bedroom. 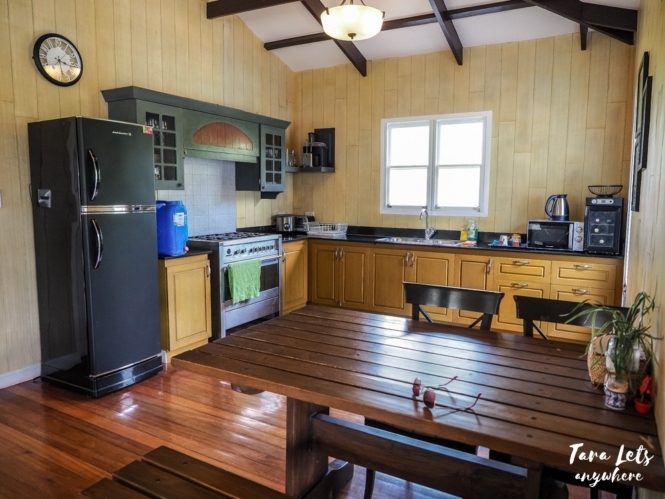 The cottage also has its own living room, kitchen, and a shared bathroom. 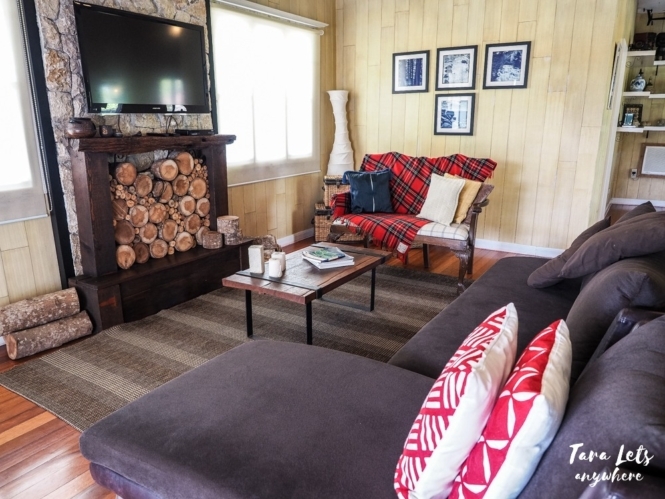 Overall, it’s warm and cozy, as you can see from the wooden paneling, faux chimney with logs, and balconies overlooking the lettuce plantation and next-door golf club. If you’re only a small group, the balcony is the perfect place to have breakfast! Balcony with view of lettuce farm and golf club. 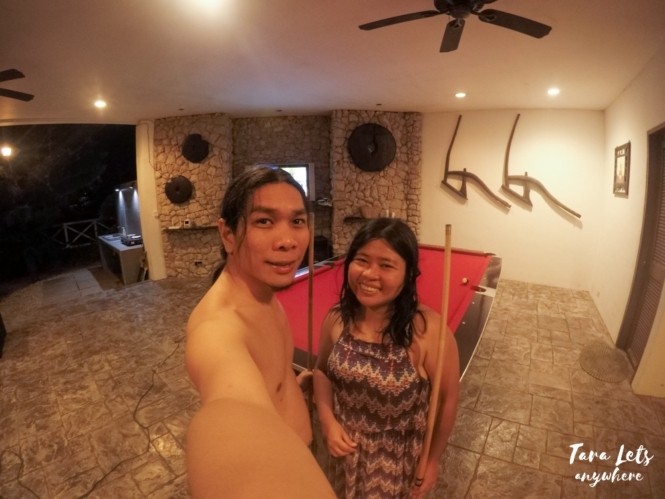 Aside from its homey ambiance, what I like about the cottage is how complete the amenities are. For example, in the kitchen you can find an electric kettle, microwave oven, refrigerator, and even a proper oven. Cookware is also provided so you can make your own meals if you want. 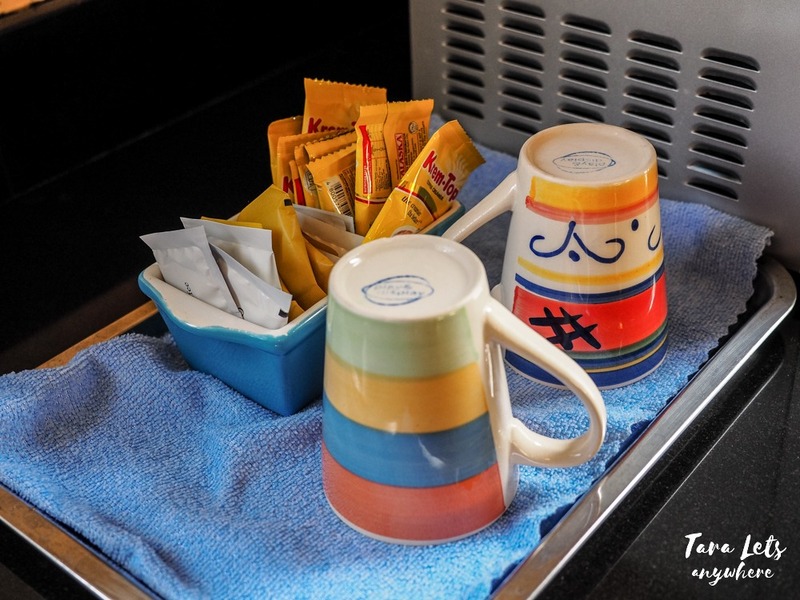 There’s a water dispenser and packets of coffee for making a hot drink in the kitchen. 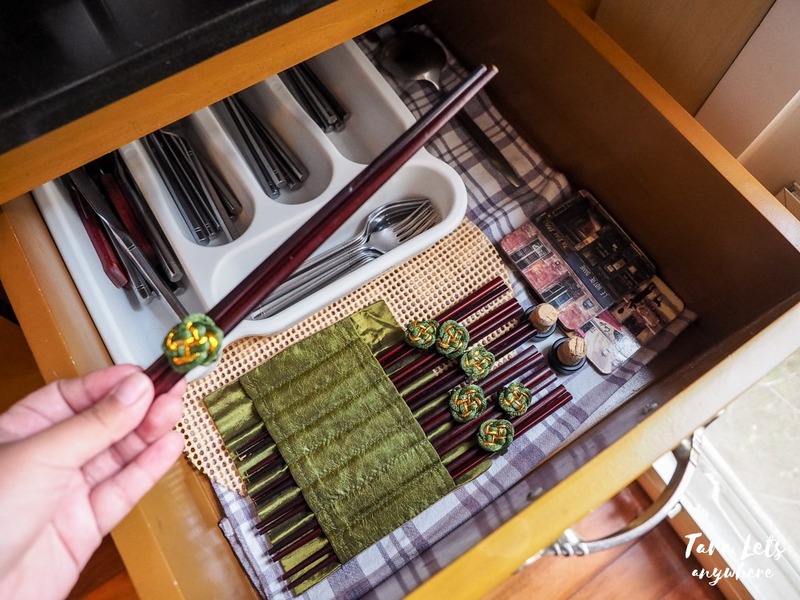 The utensils drawer is also complete and even has chopsticks! Cams (of Rest Day Adventures) and I were amused when we found this since it’s rare to find a rest house this elaborate. The same goes for the bathroom. There are complete toiletries (body shower cream, shampoo, and conditioner) and a separate area for powder and lotions. The cottage is your complete home in Casa Belinda. It has everything that you need and more to make you comfortable. 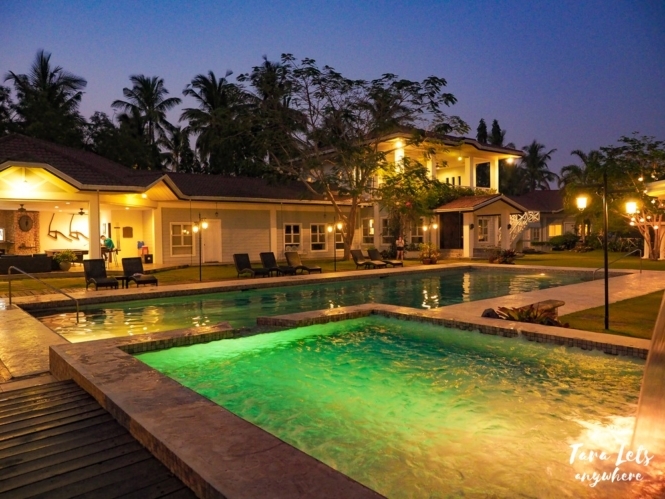 One of the highlights of Casa Belinda is its pool area. 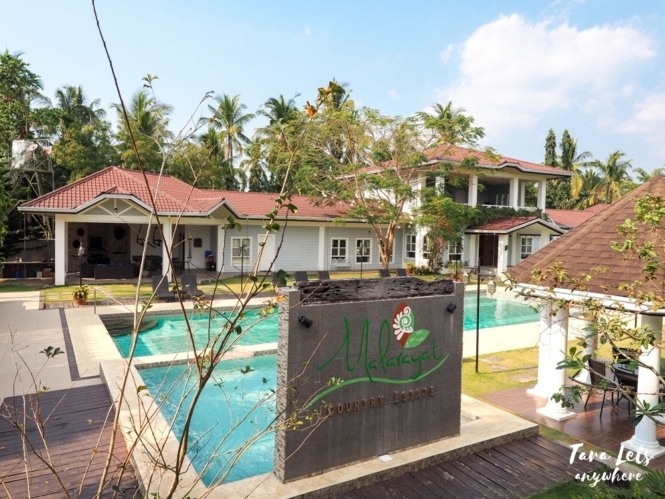 Here you can find an adult swimming pool with jacuzzi, as well as lounge beds and alfresco tables. The water in the pool is cold so you have to acclimate your bodies a bit in the beginning. Both ends of the pool are shallow but deepens toward the middle, which is perfect for adults who want a deeper pool to swim in. Alfresco tables where you can eat or chill beside the pool. Part of the pool’s appeal is that it’s surrounded by homey buildings, trees and greenery. We felt relaxed and comfortable. Pool and jacuzzi with changing LED colors. At night, the pool is illuminated by warm lighting from the posts and the bulbs hanging from the trees. The jacuzzi has an LED lighting that changes color, which adds a fun vibe to the pool experience. 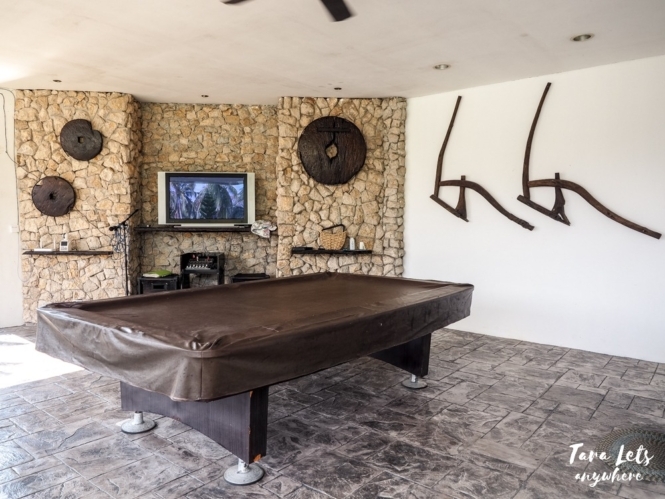 Game room with KTV and mic stand, billiards table, darts. Zeus (of ODS) singing his heart out. If you’re looking for other types of entertainment, there’s a game room with a KTV and mic stand, billiards table, and darts. It also has sofas where you can sit and just talk with each other. 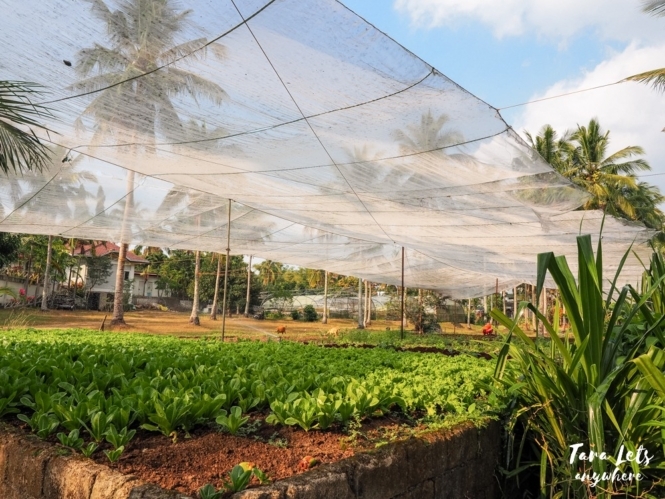 You can take a tour in the organic lettuce farm in Casa Belinda. If you’re renting the cottage, the lettuce fields can be seen from the balconies. Goat, photo requested by Hali. You can also buy a kilo of lettuce for your meals or takeout for only P250 per kilo. Casa Belinda is one of the most beautiful and relaxing private rest houses we’d been to. We came here for an overnight stay. We arrived at about 2:30PM and were immediately given welcome drinks (a delicious juice with lemon which reminded me of that we had in another organic farm) and given a tour of the property. The staff were kind, welcoming, and easy to assist us whenever we need something. Hali with a welcome drink. As said above, Hali and I chose to stay in the 2-bedroom cottage, which we’d highly recommend. 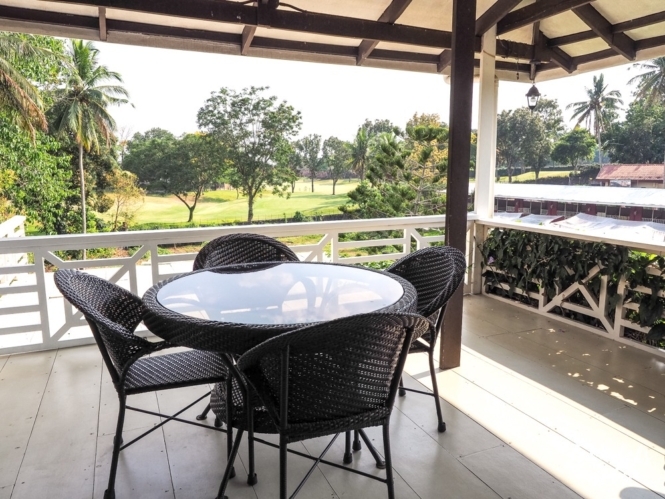 We love the complete amenities, the ambiance which made us feel immediately at home, and the lovely views that greeted us in the morning from our windows and the balcony. We also enjoyed the pool. We swam here for hours on our first day and then again on the morning before we left. It was cold, but we got used to it after a while. The jacuzzi is also a nice touch and a perfect place to chat (glasses of wine, please?). 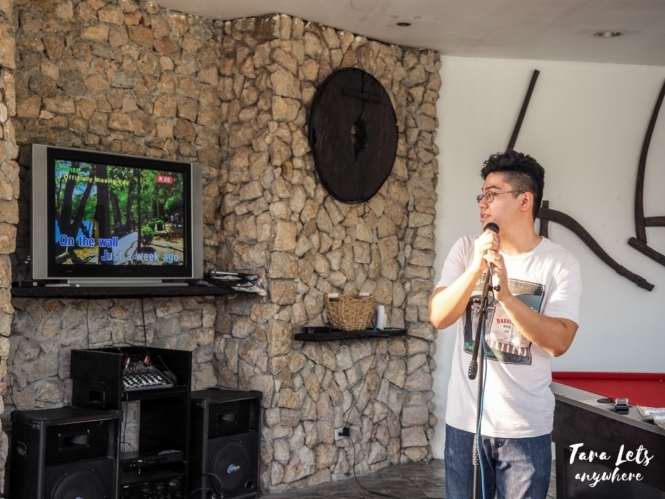 The KTV in the game room added entertainment to our group. So was the billiards table and the darts. Casa Belinda is beautiful, day or night, and we enjoyed talking, bonding, or simply appreciating the surrounding. Apol (of Hey I’m Apol) enjoying the pool. As for the food, I love that there are various options on where to eat. 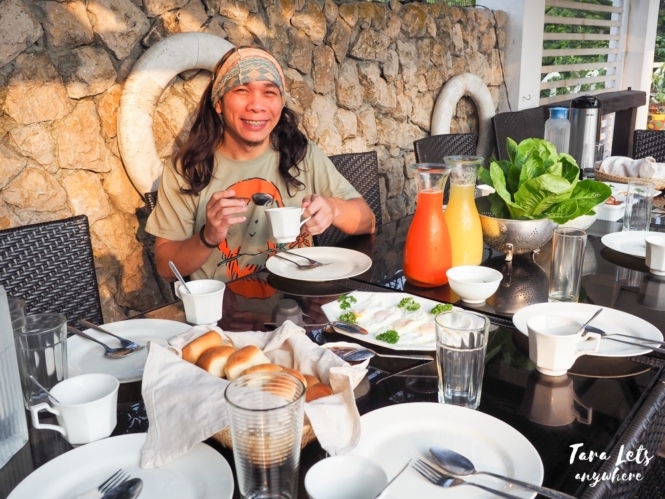 Since we were a group of 10 people, we ate at the alfresco dining area near the poolside. For dinner, we had fresh lettuce from the farm, which I used to make improvised samgyupsal with the grilled liempo. The morning breakfast was equally delightful. I love the taste, presentation, and details given to the food (e.g., the pandesals wrapped in cloth). The black coffee was good, I was re-filling my cup until we checked out. 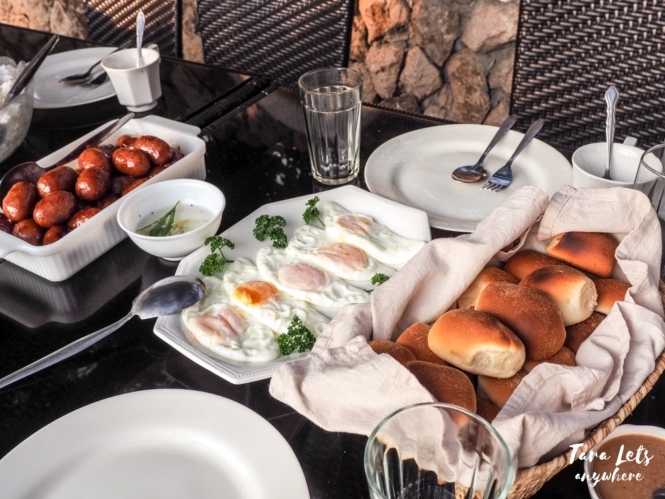 We had rice, longanisa, sunny side up, pandesal with peanut butter and coco jam, fresh juice and black coffee. 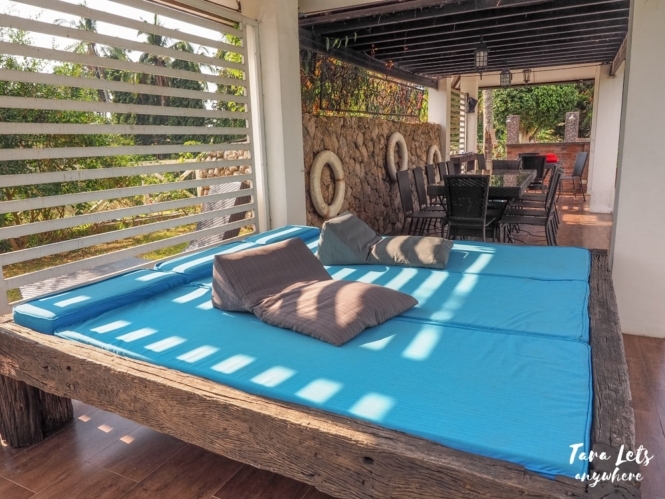 Overall, we’re happy to recommend Casa Belinda for exclusive vacation in Batangas. 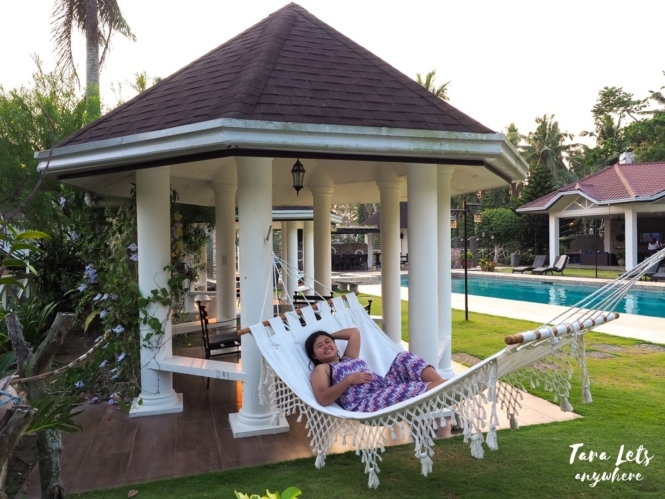 If you’re a family, barkada, or couple who want to experience a staycation in a modern rest house in a country life setting, definitely book a stay here in Casa Belinda. 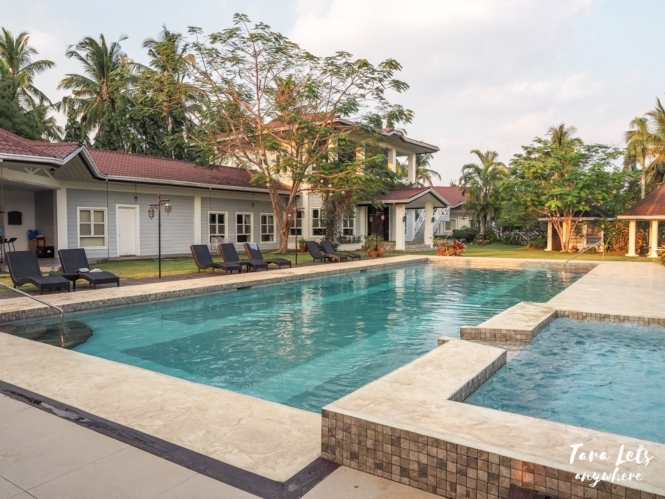 Casa Belinda is only 1.5 hour away from Manila and only 5 minutes from SM Lipa. For private cars, this place is wazeable. For commute directions, take a bus to SM Lipa and then rent a tricycle to Casa Belinda. You can also rent the whole property. Max occupancy is 24 pax. Rates start at P4500. For complete rates, please contact Casa Belinda directly. Strictly reservation only. Walk-ins are not allowed. Check-in is anytime after 2PM and check-out by 12PM (noon). For other meals, you can bring your own food or ask the staff to cook for your for a minimal fee. There is free wifi in the property. A security deposit of P5000 is required. IDs of all adult guests will also be asked upon check-in. For current rates and other inquiries, you can contact Casa Belinda in their Facebook page. For easy booking, here is their Airbnb page. 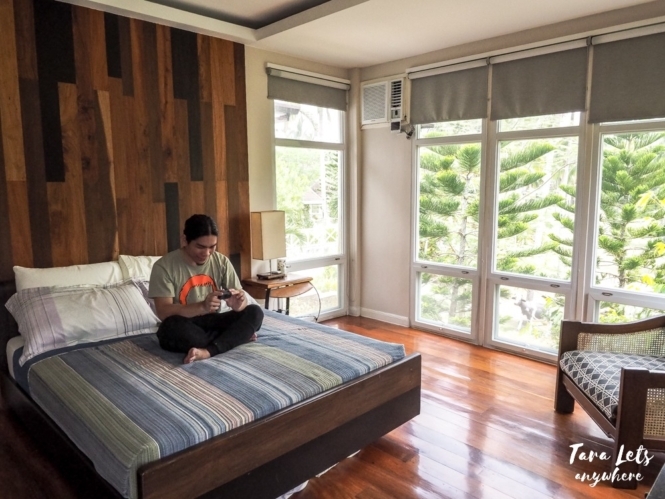 Sign up in Airbnb using our referral link and get P1600 initial credits! Disclaimer: Thanks to Mrs. Lingling Ringler of Casa Belinda for hosting us! As always, thoughts and opinions are my own. 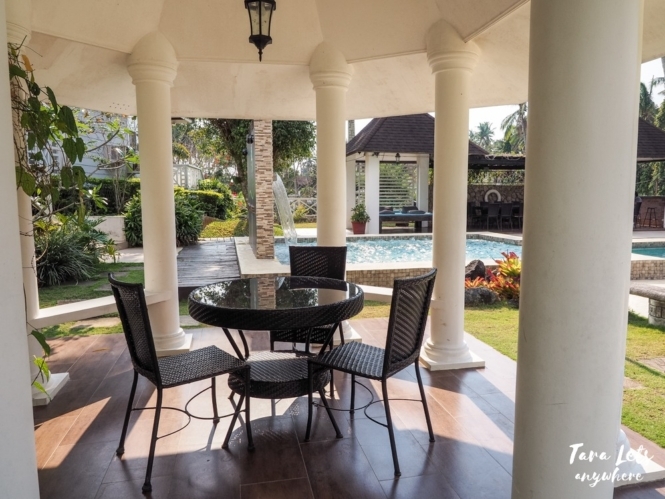 Do you have questions about Casa Belinda in Batangas? Let us know in the comments section below!